As tightline nymphing has grown in popularity, the challenge for many (including me!) has been to tie and carry flies that can be applicable to a variety of situations throughout the year. 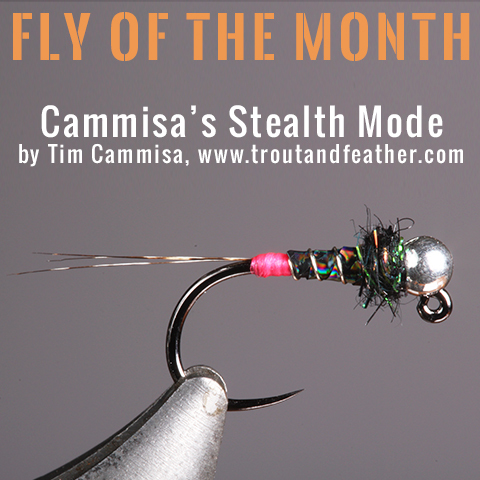 When I first started experimenting with jig nymphs, I stuck with “traditional” patterns that could be slightly modified, then expanded into newer styles; Cammisa’s Stealth Mode was a fly that consistently produced since its inception. Similar to a Lightning Bug, there are some subtle changes that I’ve made, helping the fly to take on a darker, yet still distinct, appearance. This pattern’s effectiveness relates to its rear hot spot and body material, both of which attempt to grab the fish’s attention. Hot spots are here to stay, and Glo-Brite can be utilized in different ways. A rear hot spot simply changes the location and gives the fish a look at something different. Don’t be afraid to vary the color because my experience has shown that other colors produce (fluorescent orange is a favorite for brown trout). The holographic UNI-Mylar is a favorite of mine for adding flash to many patterns, i.e. Flashback Pheasant Tail. Using the material for the body can be a challenge, thus be sure to pull it taut before winding forward. Finally, I use a drop of head cement over the hot spot for protection, and will even coat the entire body with Solarez Bone Dry before dubbing the thorax. Since this pattern is more on the obtrusive side, I tend to fish it in broken water that has some current, especially when the flow is up from average. If the water is off-color, I will throw a #14 hook, which allows for more flash built into the body. Cammisa’s Stealth Mode was tied originally for trout in the spring, but it has since proven a winner during all seasons, but especially the winter. Finally, don’t be afraid to tie it in larger sizes for steelhead, too…you might be surprised by the results! This entry was posted in Fly of the Month and tagged fly fishing, fly of the month, fly tying, fly tying materials, fly tying recipe on October 31, 2018 by Tim Cammisa. Tim, you da man! Nice tie. I’ll fill up my boxes empty slots with Cammisa’s Stealth Mode’s. Thanks for the kind words, Al, and lmk how they work for you! Tim, I have been following your stuff on YouTube ever since I started tying. I started very late I am 65 and not really good at all the fancy flies. But, I can tie the hell out of nymphs. I have also taken the Euro tightline technique on full time. It works great. I really like your “Stealth Mode” assume fly. I tie it in 12, 14 & 16 my point fly is always a different trigger color and a little heavier. It’s a fish killing combo. Thanks for the kind words, Dante, and nymphs are such fun to tie (and fish!). The tightline is an exceptional method, as you’re undoubtedly finding out. I appreciate the comments, and glad you enjoy the fly. Thanks, and if you’re on social media, be sure to connect with me. Jigs in general all fantastic producers of fish but you add a hot-spot & that ups the game. Great pattern Tim & I’ll be sure to add the “stealth mode to my arsenal of jigs.? Thanks for you recent fly. I have a request. For those of us who live in the northern regions of the U.S. and five of our months we fish on “hard water”. I personally fish a a frozen Chequamegon Bay in northern Ashland County Wisconsin. How about ice fishing jigs we can tie on our own. I have several I have tied that work in this region for panfish and Coho salmon. I normally start with a “standard” pattern and alter it by adding weight (wrapped non-lead wire) so it will sink and and can be jigged. Often times the jig is tipped with a waxie (grub). Maybe your readers have had some success with this approach and would offer suggestions.